Nikon D5100 delivers exceptionally high-quality movie performance due to its full 1080p HD capability while the latest in Full-time autofocus takes the guess work out of tracking your subjects while in motion. The D5100 incorporates an amazing array of special effects for use when taking still pictures or recording D-Movie Full HD movies. Final Cut Pro is new released with powerful new features like expanded ProRes codecs, improved speed/XML interchange/media management, etc and some time-saving improvements like automatic transfer, easy export, and so on. But this D5100 MOV video format is a long GOP format that is highly compressed, it is not a good editing format. so the 1080p MOV is still incompatible with Mac FCP NOW! So if you want to edit Nikon D5100 MOV video with high quality on Mac, you can convert Nikon D5100 MOV files to ProRes MOV for Final Cut/FCP 7 MOV before editing. Here is the step-by-step guide for you to import and transcode Nikon D5100 H.264/MPEG-4 codec MOV to ProRes MOV to Final Cut Pro 6/Final Cut Pro 7 on iMac/MacBook Pro with Mac OS X like Tiger, Leopard, Snow Leopard. Step 1. Load Nikon D5100 1080P MOV videos to Aunsoft Video Converter for Mac. Run Aunsoft Video Converter for Mac as the best mov video converter to convert Nikon D5100 1080p MOV to ProRes MOV on Mac, click the "Add" button and import the 1080p videos from Nikon D5100. Click the "Format" option, and navigate to the Final Cut Pro group,you will notice that there are profiles with Apple ProRes 422, Apple ProRes 422(HQ), Apple ProRes 422(LT), Apple ProRes 422(Proxy), Apple ProRes 4444. Here we choose Apple ProRes 422(HQ) (*.mov) as output format. To get 1920x1080 resolution, just click the "Settings" button and choose 1920*1080 as video size. Step 3. 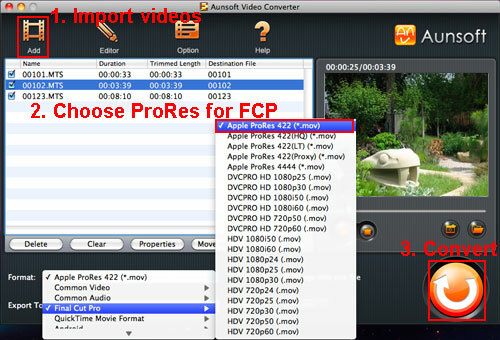 Convert Nikon D5100 MOV videos to Apple ProRes 422 HQ for FCP. Click the convert button to start the conversion from Nikon D5100 H.264/MPEG-4 codec MOV videos to standard input for Final Cut Pro ProRes 422 HQ. After transcoding the Nikon D5100 H.264/MPEG-4 codec MOV files, just import the output Apple PreRes 422 .mov files to Final Cut Pro 7 or Final Cut Pro 6 for editing and the video is in HD 1920×1080.Optimize your workflow and save time with the Apple ProRes compression for Final Cut Pro without rendering. Tips: Apple ProRes 422 , Apple ProRes 4444,introduced in Final Cut Studio, was advertised to one of the codecs to result in less compression and higher data rate/higher quality files for HD editing in Final Cut Pro.